Writers on human dignity roughly divide between those who stress the social origins of this concept and its role in marking rank and hierarchy, and those who follow Kant in grounding dignity in an abstract and idealized philosophical conception of human beings. In these lectures, Jeremy Waldron contrives to combine attractive features of both strands. 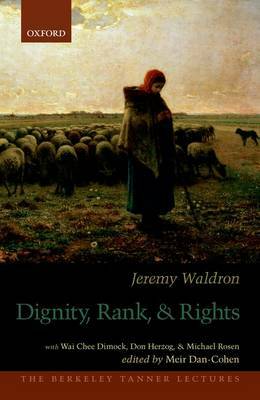 In the first lecture, Waldron presents a conception of dignity that preserves its ancient association with rank and station, thus allowing him to tap rich historical resources while avoiding what many perceive as the excessive abstraction and dubious metaphysics of the Kantian strand. At the same time he argues for a conception of human dignity that amounts to a generalization of high status across all human beings, and so attains the appealing universality of the Kantian position. The second lecture focuses particularly on the importance of dignity - understood in this way - as a status defining persons' relation to law: their presentation as persons capable of self-applying the law, capable of presenting and arguing a point of view, and capable of responding to law's demands without brute coercion. Together the two lectures illuminate the relation between dignity conceived as the ground of rights and dignity conceived as the content of rights; they also illuminate important ideas about dignity as noble bearing and dignity as the subject of a right against degrading treatment; and they help us understand the sense in which dignity is better conceived as a status than as a kind of value.